I need a little help from the Huntsville car enthusiasts. I'm trying to find a specific looking wheel for my car, but I'm having a little trouble. Either the wheel I want is discontinued or they cost $400 ea. 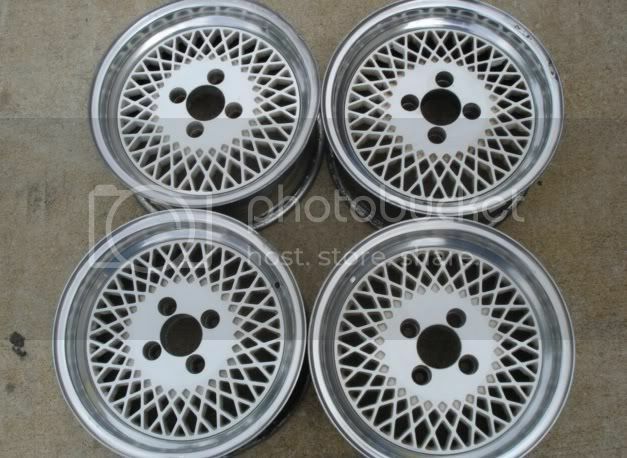 I'm trying to find a 4x100 16" or 17" mesh style wheel similar to the BBS RS style, low offset, maybe ET20 or ET35. See picture below for reference. I'd really like to find a set of the Ronal LS pictured in the upper right or the ones below. Does anyone here know where I can find some older style wheels like these? I know back in my college days there was a cool place in Hartselle off Main street that sold overstock and discontinued rims below retail prices. You may be able to dig up some Miata M-edition BBS's for (relatively) cheap but keep in mind those are more thank likely going to be 15's. I've seen a lot of wheels like this in the wheel pile at R&J salvage. I don't know the number, but it's on Bethel road off of hwy 53 in Limestone county. If you dont mind digging through a pile of rims you might be able to find what you are looking for pretty cheap! R&J's number is (256) 423-2960!